If you have a large inventory of small parts, keeping track of everything can be tedious. Unless, of course, you have a counting scale to do the work for you. They’re able to convert the weight of a batch of parts into the number of pieces in that batch. Yet it’s not always easy to find a scale that has the features you need and the confidence that your inventory is being counted accurately. Before you can pick the appropriate scale, you need to answer a few questions. Do your parts have a uniform weight? What’s the best way to keep track of and store your data? If there is too much variance in the weight of individual pieces of the same part, it may be hard to get an accurate count. To remedy this, you’ll need to use a larger sample size (for example, 100 pieces instead of 5), which will allow the scale to account for and average out any variations in piece weight. This fact may affect what capacity you’ll actually need. How Small Are the Measurements You Need to Take? As you’re looking into your options, consider the weight of your parts. A piece weight of .03211 lbs will require a scale with a finer resolution than if your piece weight was 1 lb. This also has an effect impact on the capacity you’ll need. A lot of people overestimate the maximum capacity they’ll need because they have one or two larger items they need to count. Don’t buy a higher capacity scale if the majority of your parts would be better weighed by a lower capacity scale. 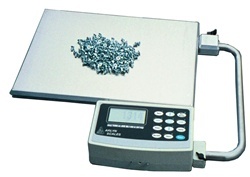 For example, if the majority of your parts batches are under 10 pounds but you have one or two things that weigh more than that, you’d want to choose the 10 pound capacity scale to make sure that your measurements (and inventory) are as accurate as possible. Resolution is the number of decimal places to which a scale can read. This is also sometimes referred to as readability. But whichever term is used, it’s how a scale manufacturer will describe the performance power of its products. So, for example, a scale with a 50 lb maximum capacity would have a resolution of 0.001 lb, meaning it could show you changes in weight as small as 0.0001 lb (for example, 48.017 and 48.018). So we would say a 50 lb capacity scale with a 0.001 lb resolution is better (or more sensitive) than a 5 lb scale with the same resolution because the 50 lb capacity scale can show you 50,000 different weight increments, while the 5 lb scale would only show you 5,000. If this confuses rather than helps you, we urge you to speak with a professional before choosing a scale so you’re sure to get the one that best meets your needs. They can help you determine which capacity / resolution combination will work best for you. What’s the Best Way to Track and Store Data? By it’s very nature, inventory data is how you’ll keep track of your inventory. But how do you get that data where it needs to go as quickly and effortlessly as possible? Does the supplier you’re talking to offer the output you need? An Ethernet connection will allow you to connect your scale to your local network, which means any computer connected to the network can access the data. Wi-Fi compatibility means that your data can be accessed on-site or remotely through the internet. A USB connection allows you to send data directly to a computer application such as an Excel spreadsheet or Access database file. We’ve also helped customers create an inventory control system using Wi-Fi where multiple shelved bins are monitored and, when inventory levels of a particular bin run low, an automated email message is triggered to alert the appropriate person that more parts should be ordered. If you have a computerized ordering system and a set number of parts you order, you can even automate the entire ordering process. Finally, if you don’t have access to Wi-Fi and can’t or don’t want to deal with wired connections, you can simply plug a flash drive into your scale where data can be recorded and, when you’re ready, the device can be removed and plugged into a workstation PC where the data can be uploaded. Counting scales range in price from a couple hundred dollars to over a thousand. Don’t let anyone frighten you into buying features you really don’t need. Do your research to find a scale that has all the functionality you need and none of the bells and whistles you don’t. Talk to your supplier and see what their prices are like. Then do some research on their competition and ask about their pricing. Buying directly from the manufacturer will almost always be more cost effective than using a distributor. Our industrial parts counting scales are manufactured right here in our Long Island, NY factory. Not only do we offer factory direct pricing, we also ship our products, which means shorter lead times and lower shipping costs. We’ve eliminated the confusing menu functions found on many competing counting scales with our unique “Quick Count” feature. You’ll only need to sample your parts once Ð the first time you use the scale. A large internal memory allows you to store the piece weight of hundreds of items and recall them as often as you need to. The intuitive interface guides you through the process step by step, making this process fast, efficient, and effortless. To protect your scale in even the roughest industrial conditions and provide you with years of trouble-free use, we’ve designed a scale with a stainless steel platform, machined aluminum frame, and four overload stops. Our counting scales don’t require any dealer set up or calibration and are ready to use right out of the box. And while our factory-direct business model offers you competitive prices and higher quality products, it also means you have the opportunity to work on a custom weighing solution that fits into your existing inventory processes and makes them run more smoothly. If you have questions about choosing a counting scale or our pricing options, contact us today. We’re here to answer your questions and help you find the best, highest quality industrial parts counting scale.